Our reviews will be based on personal field testing under actual usage conditions. As Rex Carr said about us:. "I was impressed with the substance . .and the desire to reach beyond where we are"
Our goal is to help you learn how to make your retrievers be "the best they can be" and you be "the best trainer and handler you can be" while respecting your dog above the "end justifies the means"! In 1990 we began publishing LRCO ONLINE, a magazine for the Labrador Retriever Club of Ontario. 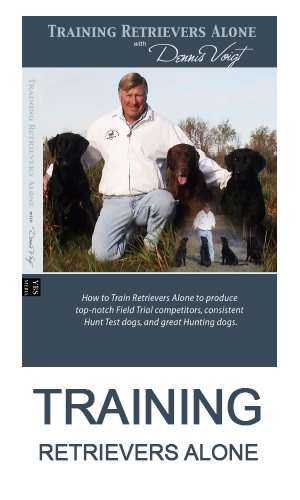 While it contained retriever news, the emphasis was on training and handling information. We recognized how difficult it was to get the “inside” information that the top Amateurs and Professionals knew. ONLINE quickly evolved into the International magazine, Retrievers ONLINE. It referred to the dogs that were online or at the line! It was many years before most retriever trainers, had much to do with being online with computers. At the end of 2014, after 25 years we stopped publishing Retrievers ONLINE as a subscription “printed” magazine. Now, with this website we really are aptly named Retrievers ONLINE. Our retriever training, handling, judging, and health information is based on reliable sources and our experience of almost 5 decades of training, competition and hunting. With 9 Field trial champions and 3 National wins we have learned much about methods for Amateurs to use as well as methods of many of the top Professionals in the country. Study visits with others and countless exchanges have provided much background. We have been often regarded as the single best source of comprehensive and advanced written information available (see our Testimonials). Of course, we continue to learn and these days there is much information available in the form of DVDs and articles and on the Internet. 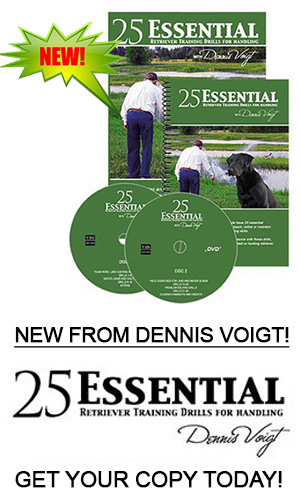 We regularly review these DVDs in Retrievers ONLINE along with solid user-based reviews of other retriever products. This site when fully developed will act as a Retriever Trainers Information Center. Articles on judging, health and products will be free to everyone. The "Best of ONLINE" Collections are sets of our best articles, custom matched to address specific topics. These are available as digital downloads and accessible by you any time after your purchase. Incidentally, you can also order back issues of magazines that are still available here. We have Back Issues of our magazine Retrievers ONLINE available in limited quantities. These are a gold-mine of information and collectors items! See the Orders menu on the website. We occasionally give Workshops geared to helping the Amateur train and handle their dog. Some of these have been in concert with Mike Lardy, Pat Burns,and Ray Voigt. If you wish to inquire please contact Dennis at Contact Us. For the past 20 years we have lived on a farm in southern Ontario with our menagerie of dogs, horses, cats, chickens and other assorted critters. Our property, often featured in ONLINE articles is managed for dog training with two ponds, hay fields and wild fields. Here and off property, we pursue our other hobbies and interests of gardening, photography, hunting (all our dogs hunt! ), fly-fishing and natural history study. We are both trained as biologists and over a combined 70 years practiced as wildlife research scientist and program biologist. Winter training is in Florida and Georgia. Over the years we have trained and handled our retrievers by ourselves. We have traveled to all 4 corners of North America with our retrievers (and often the horses!) to train, trial, judge, hunt and fish. Dennis judges on both sides of the border, including two Nationals. Dennis occasionally gives training and judging workshops, sometimes with top professionals. We have enjoyed meeting many of our subscribers and fellow trainers and competitors and hope to meet you if we have not already! We would be remiss in not mentioning all the great dogs we have watched and our own top dogs over the years.